I spent the first six weeks of 2017 making a large (for me) edition of prints for a print exchange portfolio that will be shown at the SGCI Printmaking Conference in Atlanta in March. 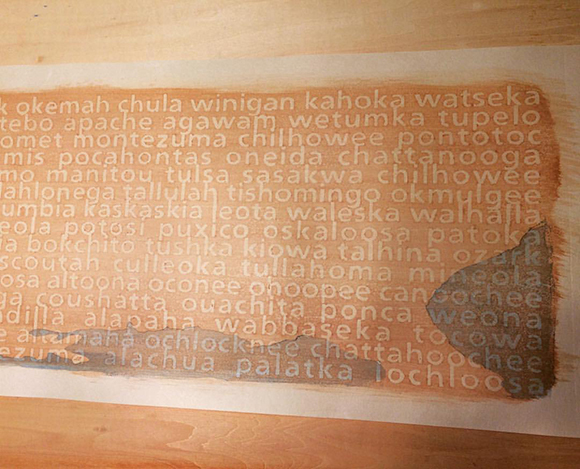 The portfolio, called Train of Ink, metaphorically retraces the journey of 72 Indians who were captured at Salt Fork, Oklahoma, and brought to St. Augustine, Florida, from 1875-1878 by train. This portfolio, organized by John Hitchcock, is the second work I've made on this topic. 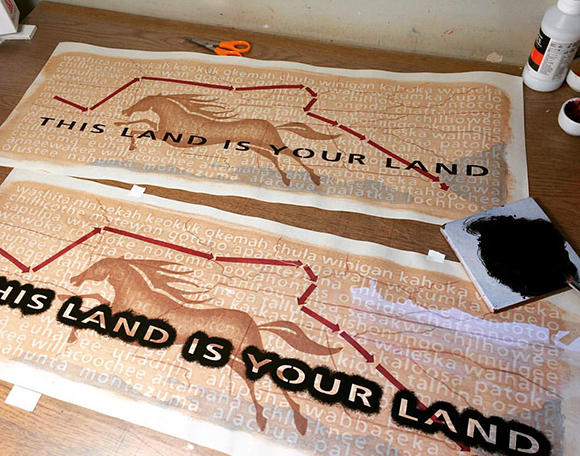 The first was a drawing which has been part of a touring exhibition called Re-Riding History. 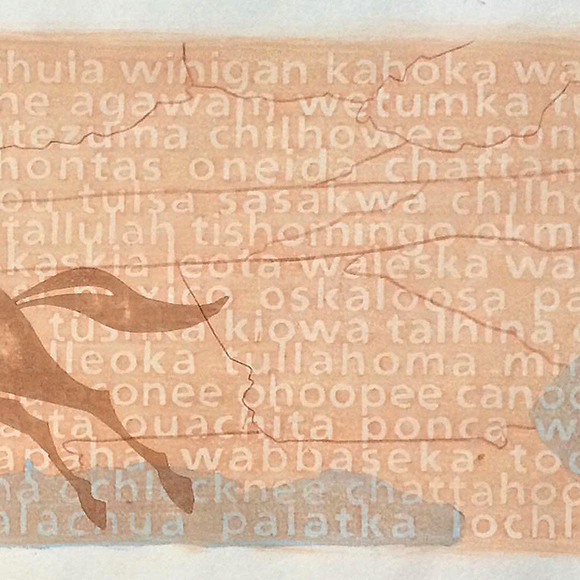 For this print, I chose to create an actual map that focuses on two conflicting movements: the motion of the text and train from from left to right (west to east – the opposite of the movement of colonization) in contrast to the movement of the horse from right to left. I also worked with depth, layering from bottom to top to depict colonization as a superimposing of one experience of geography on top of another. 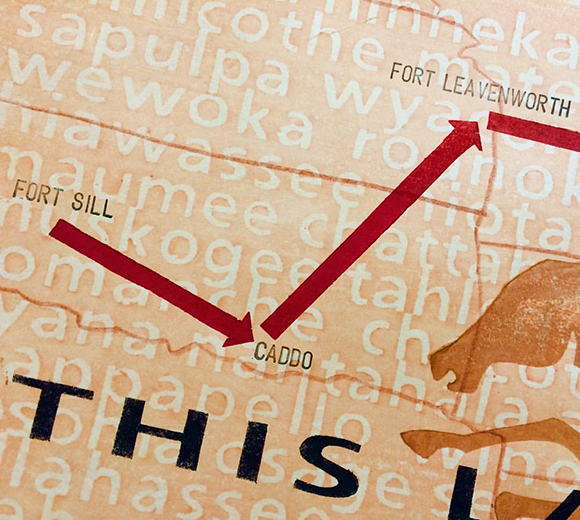 The undermost layer is a litany of Native American place names that are still in use to this day from the states that the train passed through in 1875-78. A map of U.S. state lines and the colonial place names that the train passed through are overlaid. "This Land Is Your Land" is not a popular song in Indian Country, but I think it gains new meaning when I, a descendant of European colonizers, say it in this context. 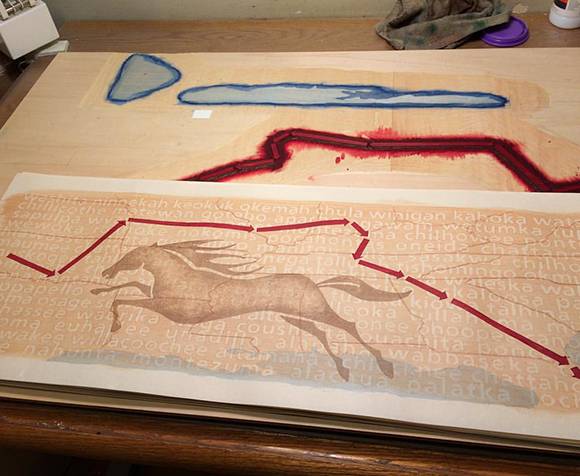 Here are a few process shots. 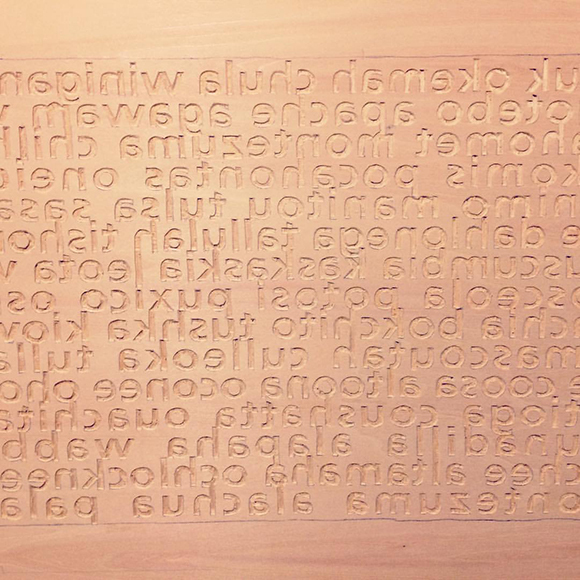 The first carved block was the text for the Native American place names. 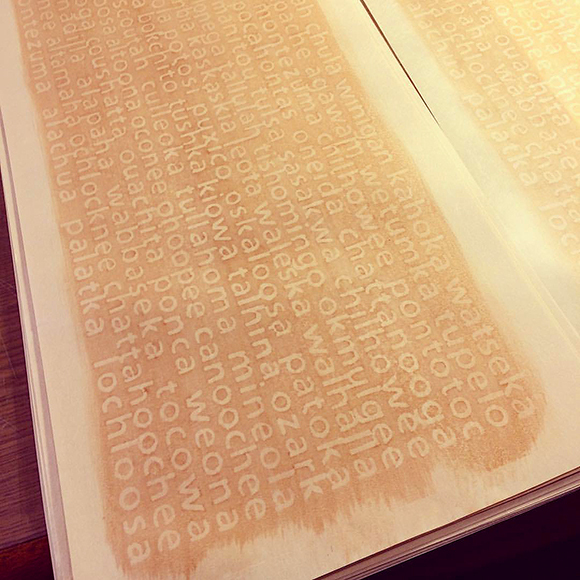 I first printed a light tan tint using an uncarved block, then printed the place names in a darker tan on top. I left the edges uncarved on both blocks so that I could have brush stroke edges rather than sharp lines. Next I printed some blue to define the ocean in the map. That's Florida over on the lower right. Next, a horse runs from east to west. This was a carved block which I printed three or four times to get the dappling and the darker edges. Next I printed the train route, from Oklahoma to Florida. You can see from the block above the print that I used the same block for several printed parts. I simply added kento registration marks wherever they needed to be to get the element onto the paper in the correct spot. 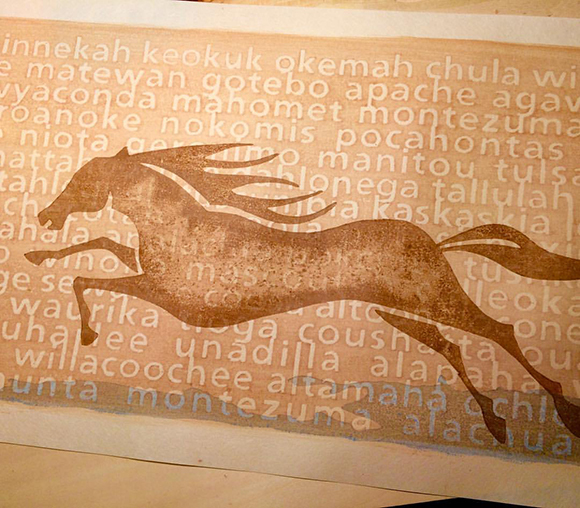 I hand cut an acetate stencil and used it to add the large black text. For ink I used Guerra lamp black straight out of the bottle and applied it with a stencil brush. Finally, I used a rubber stamp alphabet to add the train stops as the train made its way to Florida.